Mexican ambassador ‘wakes up’ and responds to Hammond ‘banter’. I am Spartacus. Notorious Gladiator barred from Facebook. Zsa Zsa Gabor goes home after head amputation. Fashion Commander in denial over G20 plain clothing protests. 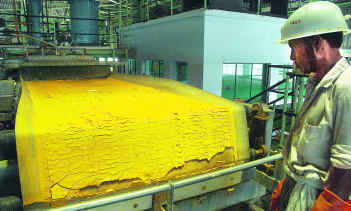 Yellowcake. A fuel source processed from mined uranium. Major world powers have begun two days of talks with Iran over its controversial nuclear programme.Negotiators, including those from the UK and US are meeting Iranian officials in Istanbul and are expected to revive a fuel-swap plan, where Iran gives up expensive nuclear material Uranium in return for more traditional types of fuel, like wood and charcoal, for a research reactor. It is expected that western officials will attempt to persuade Iran to start shedding its stockpile of low-enriched uranium, estimated to be about three tonnes, in exchange for modern fuel types such as natural gas, kerosene and biogas. As well as traditional solid fuels like beech or cedar wood, charcoal, coal, and even dung. Beech wood is said to burn clear whereas Dung, widely used in Africa and India has a second-to-none sustainability providing one is able to keep a sturdy mammal alive for an ongoing period. Some dung on the outskirts of New Delhi yesterday. The West, mores to the point the United States, suspects Iran are keen to build heavy-handed and sordid nuclear weapons, like missiles, and in recent years has imposed economic sanctions. Tehran insists its nuclear programme is as peaceful as a smoking wigwam. It is said the US state department has said Washington “was not expecting any big breakthroughs”. Western diplomats call this a confidence-building measure, or a first step. But even a first step may be extremely difficult to agree. A little bit like two first-steps toddlers indulging in a three-legged race. This is the third time in the past year and a half that the idea of a uranium-for-fuel swap has been addressed. A first version of this deal was agreed in October 2009 – but collapsed shortly afterwards. Then, in May 2010, Brazil and Turkey brokered another version on their own with Iran. But this second deal was rejected by the West as in these ecologically aware times it is suspected the Brazilians were leaning a little top-heavy on their offer of timber. Now, negotiators will try for a third time. The aim this time is to establish a “constructive process” which would see Iran “engaging and addressing the international community’s concerns about its nuclear programme”. Western diplomats suggest that they have set only one immediate goal for this round of talks. They want to persuade Iran to shed its three tonnes, of which our correspondent says, with further enrichment would be just enough to make maybe 3 nuclear weapons. The sticking point is likely to be the amount of enriched uranium that Iran is prepared to give up. Western diplomats, perhaps rather unfairly, want to ensure that there is not enough enriched uranium left inside Iran to build a single firecracker. Is fit for a queen with crown of gold. E ‘ en the very flames are cold. Is fit for a queen with golden crown. Oaken logs, if dry and old. A King can warm his slippers by. Are fit for Queen with golden crown.